Start dusting off your tartan and tams – Homecoming is fast approaching. This year, faculty, staff, volunteers, and students have put together an exciting list of more than 50 events to encourage returning alumni to plan a safe, respectful, and inclusive Homecoming. Here is a short list of five must-attend events to add to your weekend itinerary. 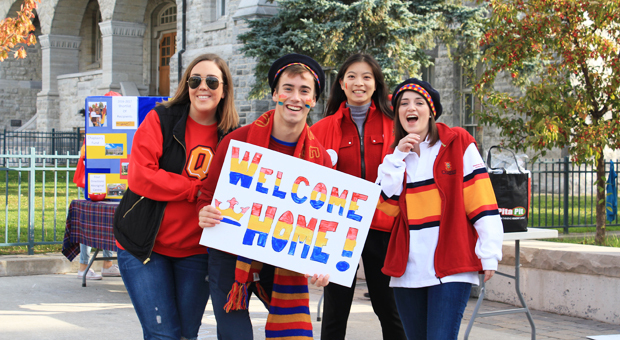 Add some Queen’s spirit to your social media posts (use #queenshomecoming to get noticed) by getting your face painted and taking a picture with other tricolour fans at the Queen’s Student Alumni Association’s Spirit Corner. Then join the alumni parade and march with the Queen’s Bands from Grant Hall to Richardson Stadium to see the Queen’s-Ottawa football game. When and where: Saturday, Oct. 20, 9:30–11:30 am beside Grant Hall. Queen’s takes on (and will surely defeat) the University of Ottawa during Saturday’s football game. But singing the Oil Thigh with old friends after every Gaels’ touchdown is only part of the fun. Salute members of the Tricolour Guard (alumni who went to Queen’s 50 or more years ago) during the halftime parade. Over the past 50 years, these Queen’s graduates have gone on to shape Canada and the world. Honour them by giving them a rousing cheer during halftime. When and where: Saturday, Oct. 20, 1–4 pm at Richardson Stadium. Come to Spirit Corner and give your tricolour spirit a boost. After only four years, the music festival has quickly become one of the most popular events of the Homecoming weekend. To add to the hype, the headliner will be announced a few days before the big event, but previous headliners included The Sheepdogs, the Arkells, Walk Off The Earth, and Serena Ryder. In addition to great music, come to Union Street to mingle with fellow alumni and enjoy a meal at one of the many food trucks. When and where: Saturday, Oct. 20, 7 pm–2 am on Union Street. Celebrate five decades of excellence as the Faculty of Education hosts several events during Homecoming weekend in honour of this major milestone. The weekend will feature a book launch, an art exhibit, a wine and cheese reception, and more. When and where: For full details on all these events, visit the Faculty of Education website. 1968 Faculty of Education graduates, the first class to convocate. You don’t have to be International Space Station Commander/alumnus Drew Feustel, PhD’95, DSc'16, to experience a NASA rocket launch or to fly through space. Head to the Arthur B. McDonald Canadian Astroparticle Physics Research Institute Visitor Centre and try the virtual reality exhibit. You can experience space without leaving Stirling Hall. While there, check out the displays about the Nobel Prize-winning research done by Queen’s Professor Emeritus Dr. Arthur B. McDonald. The institute opened earlier this year and is free to visitors. When and where: Friday, Oct. 19, 9:30 am–4:30 pm in Stirling Hall. To get involved, plan your visit, see who’s coming, and more, visit the Homecoming page to officially register.